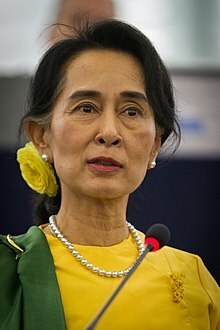 In her appeal, Aung San Suu Kyi had argued that the conviction was unwarranted. However, her appeal against the August sentence was rejected by a Burmese court on 2 October 2009. Although the court accepted the argument that the 1974 constitution, under which she had been charged, was null and void, it also said the provisions of the 1975 security law, under which she has been kept under house arrest, remained in force. The verdict effectively meant that she would be unable to participate in the elections scheduled to take place in 2010 – the first in Burma in two decades. Her lawyer stated that her legal team would pursue a new appeal within 60 days. ↑ ၇.၀ ၇.၁ Aung San Suu Kyi – Biography. Nobel Prize Foundation. ↑ ၁၅.၀ ၁၅.၁ ၁၅.၂ Moe, Wait (3 August 2009). Suu Kyi Questions Burma’s Judiciary, Constitution. The Irrawaddy. ↑ &feature=related Aung San Suu Kyi interview (video). YouTube. ↑ Buncombe, Andrew (5 July 2009). 5,000 days in captivity: The world's most famous political prisoner and a dismal landmark. The Independent. ↑ Suu Kyi rejects UK visit offer. BBC News. 26 March 1999. ↑ Burma expels Italian reporter for "illegal reporting, TV Myanmar, Rangoon, 18 August 1998. ↑ Despite the lack of an official death toll for the Depayin Massacre, Burmese dissidents claim around 70 people perished in the attack. ↑ McDonald, Mark (7 May 2009). U.S. Man Held After Swim to Burmese Nobel Peace Laureate’s Home. The New York Times. ↑ James, Randy (20 May 2009). John Yettaw: Suu Kyi's Unwelcome Visitor. TIME. ↑ The Times, 28 May 2009, Richard Lloyd Parr, "God asked me to warn her, swimmer John Yettaw tells Suu Kyi trial"
↑ Kennedy, Maev (14 May 2009). Lake swimmer could cost Suu Kyi her freedom. The Guardian. ↑ Free Burma's Political Prisoners Now! Campaign. ↑ Horn, Robert (5 July 2009). Ban Ki-Moon Leaves Burma Disappointed. TIME. ↑ Burma court finds Suu Kyi guilty. BBC News. 11 August 2009. ↑ Obama appeals to Myanmar junta to release Aung San Suu Kyi. The Times of India. 18 August 2009. ↑ Nakashima, Ellen (13 October 2003). Burma's Iron 'Aunty'. The Washington Post. ↑ For example, no one from her office contacted the Thai Foreign Ministry, which normally coordinates such high-profile visits. “As far as I know, we have not been approached by her team,” Mr. Thani said a few hours before she was to land. U Nay Zin Latt, an adviser to Mr. Thein Sein, said the president could not make time to go.“He is extremely busy with his work, and taking great care of transitioning and transformation,” Mr. Nay Zin Latt said in an e-mail. Thai officials said the president’s visit had been rescheduled for next week. ↑ MLA style: "Aung San Suu Kyi - Nobel Diploma". Nobelprize.org.13 Oct 2012 http://www.nobelprize.org/nobel_prizes/peace/laureates/1991/kyi-diploma.html.